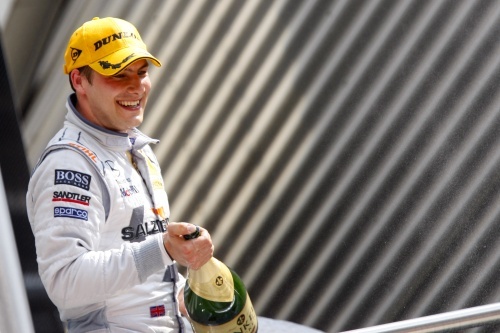 BRDC Full Member Gary Paffett worked the pit stop window perfectly at the Lausitzring Eurospeedway to record his first victory in the DTM championship for two years. There were two more BRDC Full Members in the top six with Paul di Resta taking a superb fourth place and Jamie Green in sixth in their AMG Mercedes. BRDC Honorary Member Tom Kristensen was 12th, but there was no placing for Full Member Oliver Jarvis in the Audi as he failed to finish. Andy Priaulx recorded two top six finishes at Valencia in the latest round of the World Touring Car Championship. The BRDC Full Member finished race one in fifth place while race two saw him take fourth after an epic battle with Gabriele Tarquini. Fellow BRDC Full Member Rob Huff finished 22nd in both races. His first race saw him tangle with Mehdi Bennani seeing him return to the pits for the team to see to the damage. He visited the pits once again for a drive through penalty. Race two saw a second 22nd place finish, 43 seconds off the winner.